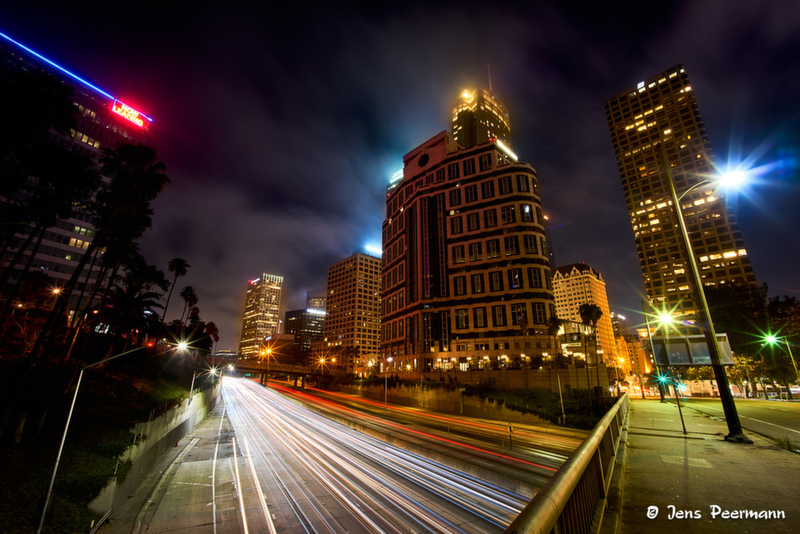 I love taking night shots in Downtown Los Angeles, so whenever I'm there I schedule at least one shoot for that passion. This one was taken about a month ago. At first I didn't like the falling lines and straightened them out. But that didn't look right; it wasn't dynamic at all. So I went back to the original and am happy with it now. Love the perspective and color, Jens. Well done! I like this angled view-the whole place seems to be in motion like some strange dream. Part of what makes this work for me is the symmetry of the angles of the buildings, and the stabilizing effect of the streaking car lights. Well done! Creative distortion is sometimes better than the standard straight lines. The distortion in this image conveys movement mirrored by the moving car lights. I like it as is. Nice colors as well. I love the deep reach colors. A7II has some good Dynamic Range. Angles looks good to me, just something different. I think the lines add a lot to the feeling here.